File this under the "We forgot we planted it" category. About two months ago we noticed a very large stalk growing in one of our flower beds. Aaron thought it looked "weedy" and was tempted to pull it. Then a similar one revealed itself in a mirrored spot across the yard. Too coincidental. Soon we discovered some very large buds on the stalks. They were the size of golf balls! Every day I came home from work eager to see if they had bloomed. But no. They took for-evah! I swear one small petal would slightly unfurl a day. We joked they would bloom and die all in one day and we would miss the entire show. Finally it happened! 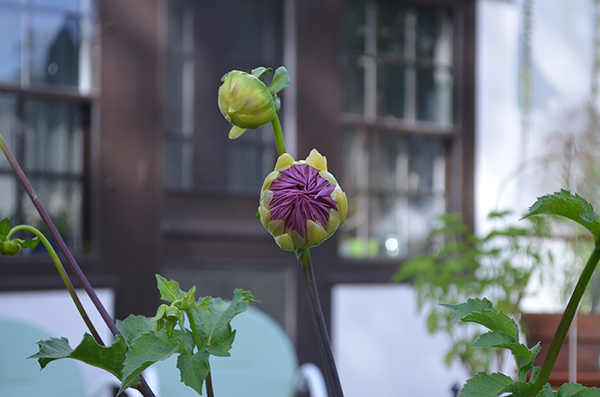 The buds opened up into giant blooms. 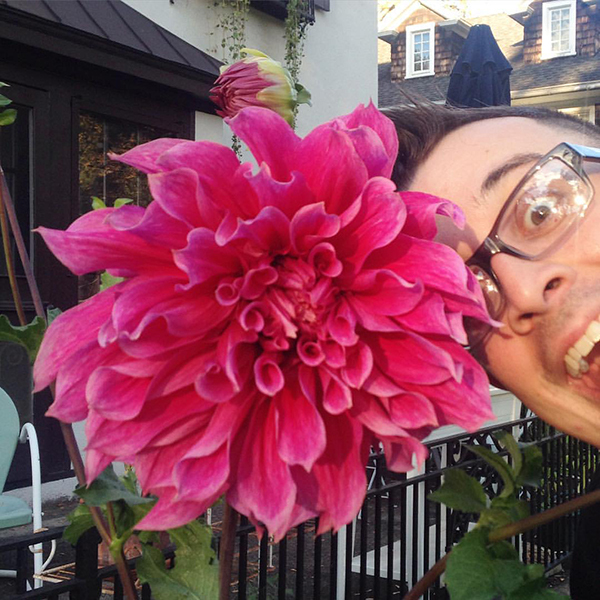 We had dahlias! 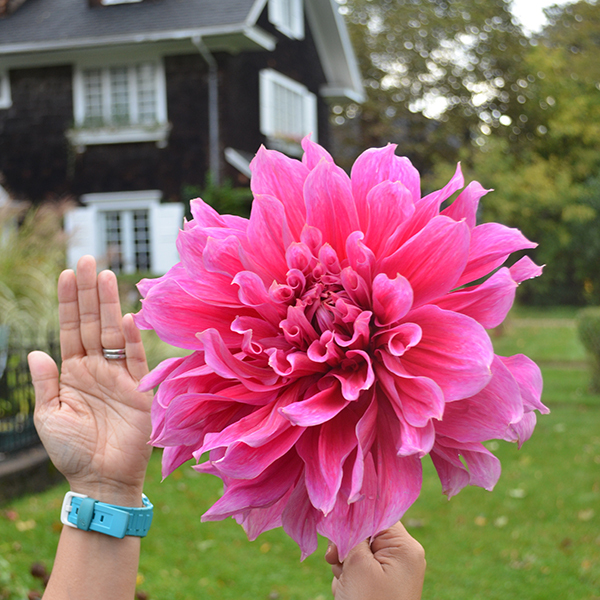 Here is my hand to try and show how ginormous these flowers are. But wait. I have little hands. Here it is next to my head! 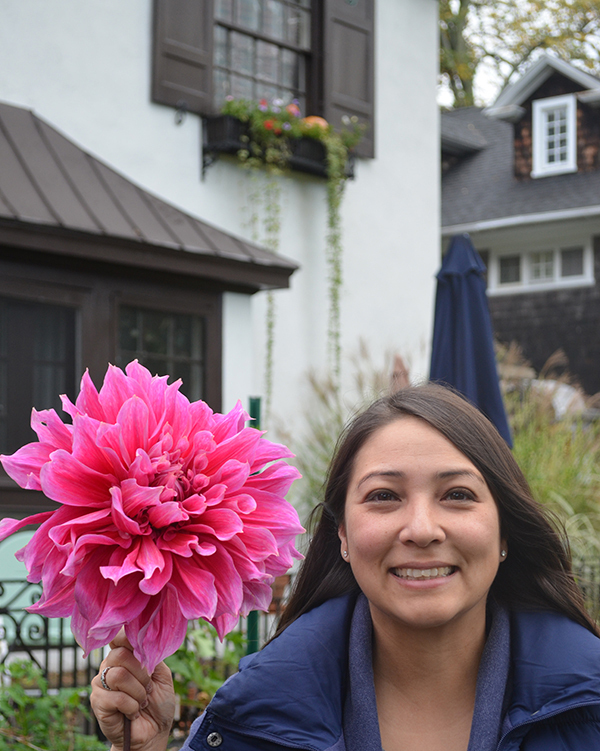 The dahlia is as BIG AS MY HEAD! 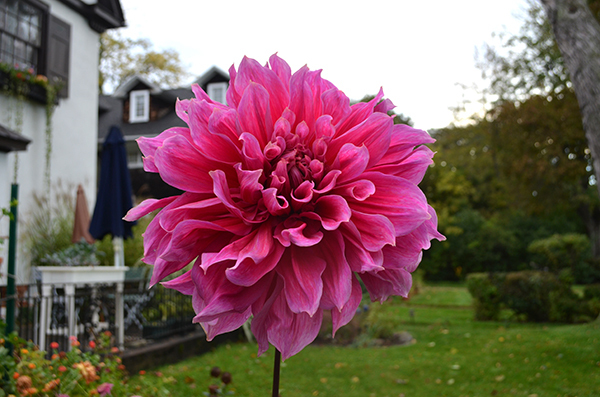 I think it might be a Hollyhill Big Pink Dahlia. Hmmm. It doesn't look as big with this photobombers head next to it. That's gorgeous! Did you have to stake it up? I want to put in more dahlias for next year and am tempted by the huge ones. Yes, when more bloomed and there were several per stalk we had to stake them. Some still broke off when it got windy but it was still worth it!